Get live feedback on your MakeoverMonday viz in this weekly webinar. Submit your viz by tagging #MMVizReview on Twitter. VIZ REVIEW is our way to provide comprehensive feedback for those who want to learn more. 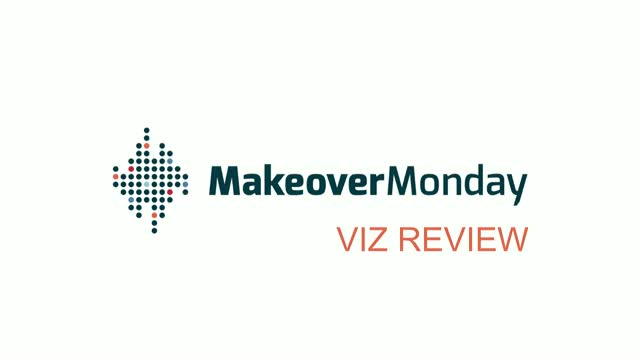 Find out everything you need to know about Makeover Monday on www.makeovermonday.co.uk (http://www.makeovermonday.co.uk/) and join the conversation on Twitter by following Andy (@VizWizBI) and Eva (@TriMyData) as well as the #MakeoverMonday community. Find out everything you need to know about Makeover Monday on www.makeovermonday.co.uk (http://www.makeovermonday.co.uk/) and join the conversation on Twitter by following Eva (@TriMyData) as well as the #MakeoverMonday community. Hear from a panel of data experts how they support non-profit organizations in their missions to change and save lives by using data and analysis. Learn about percentiles in the distribution of your data and hear how to *really* interpret a box-and-whisker plot. Get a better handle on distributions and the characteristics of your dataset so that you can communicate them with confidence. Learn from Anna Foard and equip yourself with more statistics knowledge to handle your data with ease. Ever wondered what 'average' actually means? Learn more about central tendencies and how to work with averages correctly. Anna Foard will give you an introduction on how to measure what's typical when it comes to your data. Join us live or on demand to learn more about statistical concepts that help you use statistical tools more effectively for data analysis and visualization. Our best productivity tips to help you create space for the things that matter, spend your time more effectively, and focus on your priorities. Makeover Monday is a hugely popular social data project linking hundreds of members from the global data viz community in an effort to create better charts and more useful data stories. Every week, Andy and Eva share a publicly available viz and dataset with the community. Participants then retell the story more effectively, find new insights and practice data analysis and visualization. The global community that has formed through this project consists of members from many different backgrounds and professional organisations who support each other in their learning process and share their knowledge and skills generously to contribute to the success of Makeover Monday.